British Prime Minister Theresa May is battling to save her job after staking her political reputation on a last-ditch effort to win support for the divorce agreement she negotiated with the European Union. 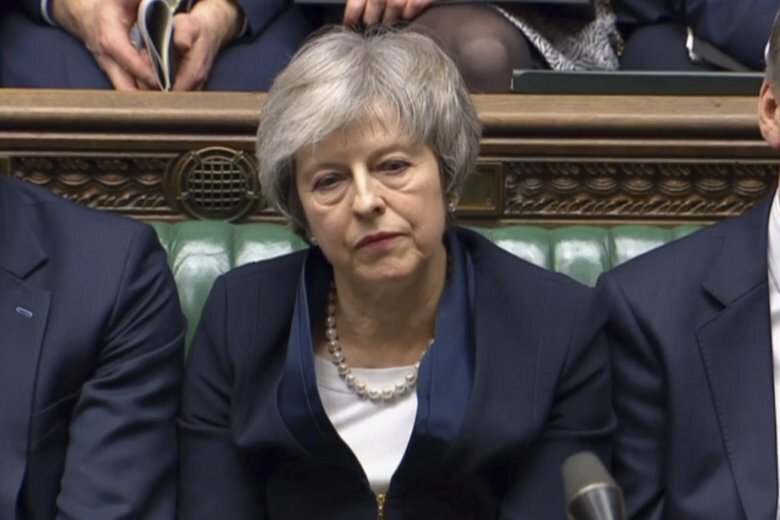 LONDON (AP) — British Prime Minister Theresa May survived a no-confidence vote in Parliament on Wednesday to remain in office — but saw more of her power ebb away as she battled to keep Brexit on track after lawmakers demolished her European Union divorce deal. After defeating the no-confidence motion, May said she would hold talks “in a constructive spirit” with leaders of opposition parties and other lawmakers in a bid to find a way forward for Britain’s EU exit. She appeared outside her 10 Downing St. residence after meeting the leaders of several smaller parties. The prime minister named the parties in a statement in which she called on opposition politicians in Parliament to “put self-interest aside” and find a consensus on Britain’s path out of the EU. Despite May’s pledge to seek a broad consensus, there was no sign of an immediate breakthrough. Opposition leaders brought her a laundry list of sometimes conflicting demands. Labour’s Corbyn said he would not meet with May until she ruled out a no-deal Brexit. Scottish National Party leader Nicola Sturgeon said she needed to keep the option of a second Brexit referendum on the table. May insisted that any new Brexit plan must “deliver on the referendum result,” which she has long interpreted to mean ending the free movement of workers to Britain from the EU and leaving the EU’s single market and customs union. Investors appeared to shrug off both the rejection of May’s deal and welcomed the survival of her government. The pound was up against the dollar early Wednesday and rose further after the no-confidence vote to $1.2880.